Most of them won’t admit it to you. When the litter box odor situation is out of control, guests know you have a cat the second they walk through the door. It’s not because you’re smart or even because your clothes are covered in cat hair. It’s because of that smell. Don’t be “that cat person” who doesn’t know they live in an invisible cloud of stench. Once you’ve acclimated to the smell, you’re essentially a lost cause. You can’t give your cat the clean, virtually odorless litter box they deserve until you get fed up with the smell and do something about it. Your cat’s litter box doesn’t have to smell terrible. Yes, some odor is unavoidable. You can’t keep a cat in your home without some odors – malodorous waste is a part of life, and in small doses, it’s something to be thankful for. It’s a reminder that you’re peacefully sharing your home with a beautiful living creature. Despite the inherent smell associated with any animal waste, there’s no need for your cat’s litter box to constantly reek. Even a multi-cat home can be virtually odor-free if you know how to properly manage the litter box. Cats are naturally clean animals. You’ve seen your cat grooming throughout the day, fastidiously smoothing and cleaning his or her coat and skin. Besides hating being dirty, cats have at least twice as many olfactory receptors than do humans, giving them a superior sense of smell. If your cat’s litter box smells bad to you, it’s probably worse for your cat. When your sensitive kitty is offended by the smell of their litter box, they may decide to find a newer, cleaner place to eliminate, like your bed, a couch, or in the corner of the room. Inappropriate urination is a serious problem that can quickly spiral out of control as your cat becomes attached to the new location, cleaning costs build up, and you struggle to encourage your cat to use the litter box again. It’s one of the most frustrating things that a cat guardian can deal with. Even worse, some cats have a more self-destructive response to an unpleasant, smelly litter box. Instead of opting to use an alternate location, they’ll avoid elimination altogether. This can lead to constipation and urinary tract disease. So let’s put an end to the odor. You know your cat’s litter box reeks, and you’re tired of it. You want to do the right thing for your cat, your family, and anyone who passes through your home. You’ve probably already tried a thing or two – maybe switched litters a couple of times or picked up the scooping frequency. Maybe you’ve tried everything you can think of, and yet the odor persists. Here are eleven simple, but long-lasting changes you can put into action today that will help you say goodbye to offensive litter box smells. Do these 11 things today and get rid of litter box odor for good. 1. 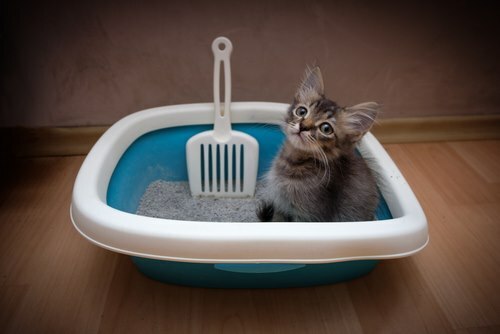 Clean the litter box – and do it the right way. You already know you should scoop out the litter box at least once a day. Depending on which type of litter you use, you’ll also need to empty and thoroughly clean the box between once a day and once a month. Remember, due to the risk of toxoplasmosis, it’s not a good idea for pregnant women to handle dirty litter. If you’re pregnant, the toxoplasma gondii parasites that cats often shed in their feces could infect the placenta and your unborn child. Congenital toxoplasmosis is a serious and sometimes fatal condition. Again, scoop at least once a day. Some people scoop twice a day or even every time their cat uses the litter box. If you have this kind of dedication and an adequately flexible schedule, frequent scooping is one of the best ways to fight back against litter box odor. Instead of letting the box lie flat on the ground, tilt the litter box so that you can see any waste that’s stuck to the bottom and sides. Scrape it out and discard it. Don’t be lazy– Go over the litter a few times to make sure that all of the soiled chunks are out. Under typical conditions, wash the litter box at least once a month. When you’re dealing with an odor crisis, you may want to increase the frequency beyond manufacturer recommendations. If you’re using a clumping or crystal litter, you’ll have a little more flexibility. 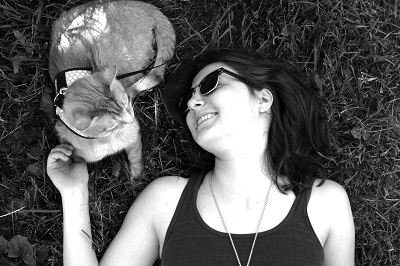 Assess what frequency is comfortable for you and your cat. Empty all of the litter. If there’s any residue caked to the inner edges of the box, scrape it out. Using warm water along with gentle dish soap, a mild 1:32 solution of bleach and water (one cup of bleach to a gallon of water), or vinegar, scrub out the litter box. Once you’ve removed any residue, thoroughly rinse it out. If you prefer, you can take the box outside and spray it with a hose. If possible, leave the box outside to dry in the sun for a few hours. The ultraviolet radiation can help to disinfect the box. Unless you’re pregnant or immunocompromised, give your cat’s litter box an extra scooping. It doesn’t matter if you’ve already scooped today. Turn on some music and just do it again. Your cat will thank you for it. 2. Use the right litter. There’s a world of kitty litter out there and not every type offers good odor control. Some products attempt to mask odors with synthetic fragrances, while others simply don’t do anything. Let’s take a look at the different types of cat litter on the market and determine which offers the best odor control for your cat. This is the most popular type of cat litter. It’s usually good at controlling odors and makes cleaning out the litter box easy. Some clumping clay litter products are made with natural deodorizers like activated carbon and baking soda, which can help to neutralize odors. If your cat is still a young kitten, clumping clay is not recommended for them. Because of the risk of sodium bentonite clay leading to intestinal blockage, kittens shouldn’t use clumping litter until they’re 3-4 months old. This litter is a notorious failure at odor control. Unlike clumping clay, which is made from sodium bentonite clay, this type of litter is made with clay that absorbs but doesn’t clump. This means that you can’t scoop out urine. Ammonia odors will build up quickly. You’ll need to dump out all the contents of the litter box every few days. This type of litter is made from highly absorbent silica gel crystals. These crystals are non-toxic and incredibly good at soaking up liquid. Instead of clumping, this type of litter absorbs urine and dehydrates feces. 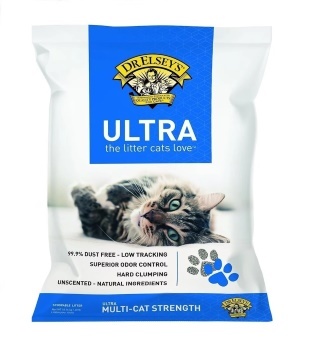 Because it’s so absorbent, this type of litter offers good odor control. It’s also easy to use. If you don’t like scooping litter, you’ll the convenience of crystal litter. Just scoop out solid waste, stir the remaining litter, and dump it out when the litter turns yellow or tan. You can safely change out crystal litter as infrequently as once every month. These products come in a variety of formats and are made from a range of materials, usually plant-based and free from any harmful additives. One of their main selling points is their biodegradability, which sets them apart from clay litters, which don’t break down in the environment. Popular types of biodegradable litter include corn, wheat, walnut, wood, grass, and paper. A few types are recognized for their excellent odor control abilities. Wood litter is extremely absorbent and usually does a good job of stopping odors. While effectiveness varies from product to product, the natural capillary system of wood fibers helps to trap moisture and odors for long periods of time. Clumping wood litter and non-clumping pellets are both available. As always, the clumping type works best, but non-clumping wood litter also has a good reputation for odor control. Grass litter has good odor control ability, clumps well, and is one of the most effective types of biodegradable litter on the market. Corn cat litter is another popular choice among those seeking a good litter for odor control. It’s also highly absorbent, clumps well, and traps odors effectively. Corn cat litter is prone to aflatoxin mold growth, which could lead to serious disease. If you haven’t experimented with varied litter in the past, now is a good time to try. If you typically use a non-clumping litter, switch to a safe clumping product. If you usually use a product that doesn’t contain deodorizers, try one that does. If you haven’t had much success with a traditional clay litter, you might want to experiment with a clumping wood-based litter or one made from silica gel crystals. Some cats are sensitive to changes in the litter box, so it’s a good idea to gradually incorporate the new litter over the course of a week. 3. Clean up your cat’s diet. The best time to stop litter box smells is before they start. While cat urine is naturally potent, their feces doesn’t have to reek. Foul-smelling feces is often a byproduct of a low-quality diet. A diet packed with indigestible, non-nutritive ingredients leads to more waste and a smellier litter box. As obligate carnivores, cats process a meat-based diet more efficiently than one that’s full of nutritionally void fillers like corn, soy, wheat, and plant protein. A highly digestible, low-waste diet can help to reduce the amount of odor your cat produces. 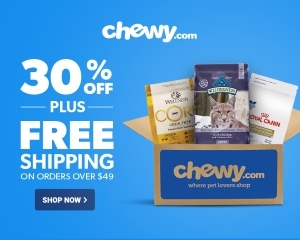 People who switch their cat from a conventional commercially-sold diet to a balanced raw diet regularly remark on the change in their cat’s stool. Re-read the labels on your cat’s current food. If it contains corn, soy, or wheat, seriously consider switching to a better diet that honors your carnivorous cat’s biological needs. 4. Use a litter box deodorizer. You set the foundation through regular scooping, the right cat litter, and a good diet. A deodorizing product takes it a step further by absorbing any remaining odors and moisture. Litter deodorizers come in numerous types, including basic powders, which are typically baking soda-based, heavier granules made from zeolite and other absorbent odor-neutralizing minerals, deodorizing sprays, and deodorant beads. In addition to products marketed specifically as cat litter deodorizers, you can use baking soda instead. The same properties that allows baking soda eliminate odors in the refrigerator effectively absorbs and eliminates odors in the litter box. Ordinary baking soda is highly effective and made without artificial fragrances that could irritate your cat. Sprinkle a little baking soda in the bottom of the litter box. If your cat seems comfortable with the change, consider making baking soda a regular addition to the litter box or try a commercially-available litter deodorizer. 5. Choose the right litter box. The right litter box is the foundation for a healthy, minimally odoriferous litter environment. Choose a litter box that is at least 1.5 times as long as your cat (minus the tail) and at least equally wide. If your cat measures 18” from nose to rump, the box should be at least 27” long and 18” wide. 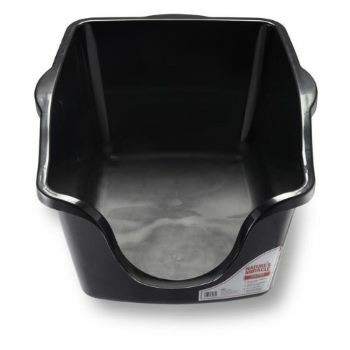 This makes it a comfortably spacious area for your cat, discourages accidents over the edge, and keeps the litter box from getting full too quickly. 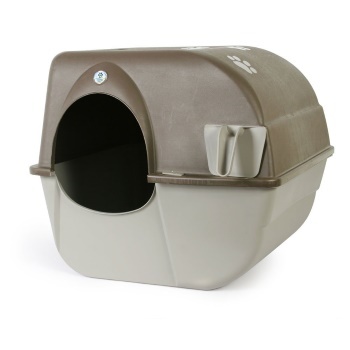 A hooded litter box can help to contain odors. As long as the box is scooped daily and kept clean, there’s nothing wrong with using a covered box. Cats generally show no preference for covered or uncovered boxes, but it’s important to be prudent and think of your cat before making a decision. If the odor is serious or the box isn’t well-maintained, the enclosed space could become a stinking chamber of unhappiness for your cat. 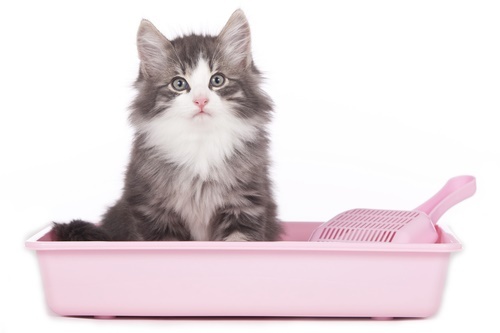 Some litter boxes have non-stick coatings that help to prevent clumps of urine from sticking to the sides of the box. Ideally, the box should have accessible corners and edges that are easy to scrape. Inside curves, for example, can make it difficult to completely clean the litter box. The entire design should facilitate easy and thorough waste removal. You might also opt for an automatic litter box. 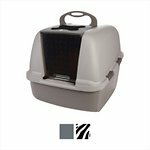 While these can help to free you from the burden of scooping cat litter, automatic litter boxes are expensive and might scare away your cat with the noises they make. Inspect your cat’s litter box. If there is a lot of litter cemented to the inner walls or trapped hard-to-access corners or rounded edges, think about switching to a new box. In the meantime, consider using a litter box liner or spraying the inside of the box with cooking spray to discourage sticking. 6. Use more litter boxes. Chances are that you don’t have enough litter boxes. The general rule is to provide one litter box for each cat, plus one extra. If you have one cat, use two litter boxes. If you have eight cats, you’ll need nine boxes. This helps to distribute the waste across multiple boxes, ensuring that no one box builds up too quickly. In multiple cat households, rivalries and tensions are quick to arise. Providing a separate box for each cat can help to reduce stress and discourages litter box avoidance. Of course, providing multiple boxes isn’t always practical. Multiple cats sharing a single box should share a single large box that can handle the heavy traffic and increased odor. Count your litter boxes. Are you providing enough for all of your cats? If possible, add enough new litter boxes to support demand. Don’t put your cat’s litter box next to a heat source, where the waste will sit and slowly cook. Instead, select a cool, dry place. When choosing a litter box location, temperature shouldn’t be the only consideration: choose a calm, quiet place where your cat will feel at peace. Providing a safe, low-stress place for your cat to use the litter box can also help with inappropriate urination – another way to keep your house smelling fresh. Evaluate the location of your cat’s litter box. Is it near a heat source? If it’s near a water heater, heater vent, or a wood stove, move it to a cool, quiet new location. 8. Use the right litter scoop. Using the right tools makes you a better scooper. A great cat litter scoop captures every last crumb of soiled litter and easily digs out litter stuck on the bottom of the box or trapped in corners. If you’re guilty of putting off litter box cleaning, a good scoop makes the task easier, encouraging you to do it more often. Next time you scoop your cat’s litter, let yourself dream. Could your scoop possibly work any better than it does? Could the scoop glide through the litter more smoothly, effortlessly separating clean and dirty litter? Could it be made from stronger materials? Could it have a better edge for scraping the bottom of the pan? If the answer to any of those questions is “yes”, think about investing in a better litter scoop. 9. Use wet wipes to clean up the sides. Not everything will land in the litter: many cats, particularly females, urinate towards the walls of the box rather than into the litter-filled bottom. Since this waste isn’t always obvious, it can build up in between full cleanings and contribute to litter box odor. While scooping your cat’s litter, use a non-toxic wipe to clean any mess from the plastic sides of the box. This helps to minimize odor buildup between complete cleanings. Next time you clean out the litter box, use a non-toxic wet wipe to clean up any messes on the walls and around the edges of the box. Remember, it’s important to use a non toxic wipe that’s completely safe for your cat. 10. Keep the area around the litter box clean. Litter box odor doesn’t only come from the litter box. If your cat has a tendency to go over the edge of the litter box, the surrounding floor could become saturated and permanently smelly. Odors may also soak into mats or other objects in the area surrounding the litter box. Avoid odor buildup in the area around the litter box by sweeping, vacuuming, or mopping regularly. Make sure the scoop is clean, too. Do a little extra cleaning around the litter box. When the room is dark, use a black light to inspect the area around the litter box. You may find deposits of urine that soaked in months ago and are still creating noxious odors. Here’s a guide to using a black light to detect cat urine stains. 11. If the odor started suddenly, rule out any health problems. Finally, sometimes intense litter box odor can point to health problems. Unusually odoriferous urine and feces alike may both be indicative of something wrong. Abnormally smelly urine could indicate that your cat has a urinary tract infection. If your cat’s urine suddenly smells worse than usual and the odor is accompanied by other symptoms like straining, mewing in the litterbox, excessive licking, and blood in the urine, it’s time to bring your cat to the veterinarian. Similarly, if your cat’s feces suddenly smells worse than usual, it could signal problems in the digestive tract. Bacterial infections, parasites, and food sensitivities can change and intensify the odor of your cat’s stool. Identify when the odor problem began. If the onset of litter box odor coincided with other symptoms or a dietary change, it’s time to eliminate the trigger. This may involve eliminating certain ingredients from your cat’s diet or scheduling an appointment with your veterinarian. Ultimately, keeping cat litter box odor under control is mostly a matter of keeping the box clean. If you use the right tools, scoop regularly, clean the box and surrounding area, and have a healthy cat, litter box odors shouldn’t be a problem. If you put all of these ideas into action, you’re almost guaranteed to end up with a practically odorless home. Your cat will be happier, you’ll breathe easily, and guests might even comment that they “didn’t know you had a cat!”.